I suppose I should be used to being portrayed as a negative, nitpicking, uninformed misanthrope…but I’m not used to it and I don’t think my perspectives should be characterized that way. I realize that offering a contrary…but hopefully accurate…position on all things audio from formats to marketing spin about high-resolution audio can alienate people with vested interests in the status quo. But I was surprised that Paul McGowan (head of PS Audio), who I have considered a professional associate and have visited in Boulder (after all he was the inspiration for this blog), pushed back rather hard after my posting of the spectra on his demo disc “One”. On April 19,2016 Paul focused his daily blog post on the “ONE Music Project”. He claimed, “it’s the single best demo disc” he has in his library — “bar none”. Later in his post his unbounded enthusiasm continued, “it (a preliminary CD that Gus Skinas produced) sounded surprisingly close to the high res PCM version. Really. Just amazing”. A reader of my review and analysis wanted to know Paul’s reaction to the spectra that I did of the “so-called” high-resolution music tracks. You can revisit the article by clicking here. He wrote an asked Paul what he thought. He began with an inappropriate personal and professional slur about my expertise that doesn’t deserve repeating…then continued. “Mark is simply using his abrasive, negative, misleading style to rehash a lot of the old tired anti-DSD lines that he loves so well. For example, just because the noise floor is rising doesn’t mean the signal level is falling, he’s not showing that there’s no HF content, he’s just showing that he’ll take any opportunity to bash DSD. I complimented Paul and his collaborators on a really wonderful collection of tunes and his efforts to provide the musicians represented on the disc with an opportunity to get their music out to a larger audience and make some money in return. However, I knew that recording the project on a Sonoma DSD 64 system would produce spectra with excessive amounts of high frequency noise. It’s unavoidable. There’s nothing misleading about presenting the truth about the noise-shifting requirement of DSD. Take a look at the following illustrations. Figure 1 – A comparison of a DSD 64 and 96 kHz/24-bit PCM track. I selected a track from the Nitty Gritty Surround album because it is musically similar to the track on the ONE Music project by Elephant Revival. The DSD 64 track was provided to me as a download at 176.4 kHz. 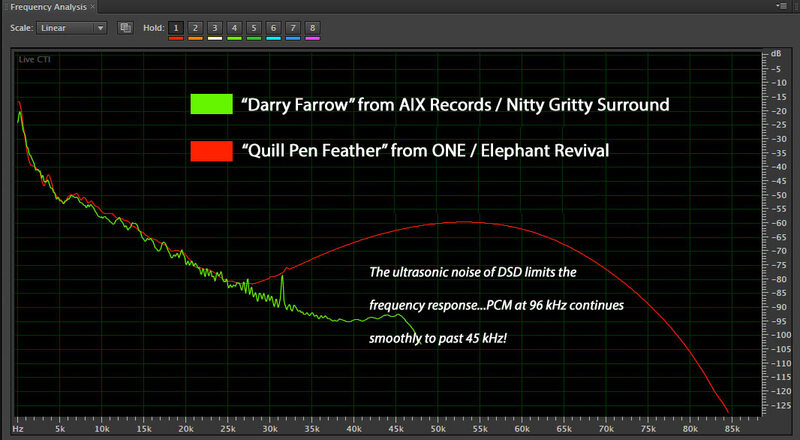 “Darcy Farrow” was recorded at 96 kHz/24-bit PCM. One might think that the 176.4 kHz track would have more high-frequency information…but it doesn’t. The cloud of ultrasonic noise from the DSD noise shifting masks this frequency range. 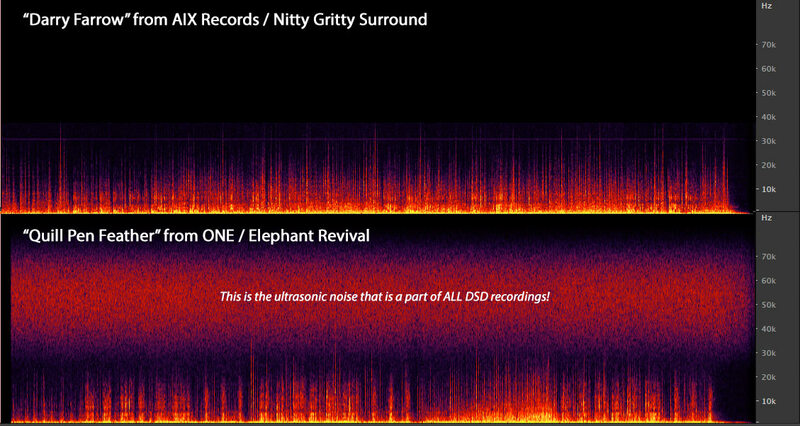 The net result is that the net frequency range of the Elephant Revival track could be completely captured using PCM at 48 kHz. The downloaded file would be almost 1/4 the size of the current version. Mark, despite the inroads of digital we are in a dark, turbulent period where anything goes to make a quick buck. Don’t ever give up fighting the good fight, or spreading your knowledge to others in any way possible to fight the good fight. I think of you as someone like Ali, who never compromised his principles of truth and honesty, and backed them up when many called him traitor. That is how they view you for standing up and exposing their weaknesses, their faulty methods buried in hype to separate fools from their money. Every convert, every new ear you win, is another blow against them. A blow for pure recorded audio fidelity. Face Front, ‘Nuff Said as another revolutionary once quipped. I will continue to offer factual observations about all things audio. Thanks. Everyone to their own. I learned to ignore Paul years ago. Snake-oil salesman. They have been around forever. Until Paul divulged his very negative opinion of my writing, I believed that he was a serious colleague and friend. I was wrong. Bold and much appreciated Mark. Then again, not so “bold” as it’s appropriate. to “belong”, damn the metrics. It’s true that marketing is all important in selling virtually everything from Tesla automobiles to political candidates. I have not problem with Paul’s support for his project…but it’s too expensive and doesn’t benefit from 174 kHz sampling. Thank you for taking the heat to reveal some truth. I don’t think you’ll lose any real friendship points with PS Audio or Mr. McGowan – at least his customers will be better off informed. I simply did an analysis of the tracks and pointed out the erroneous assumption that bigger is always better. I think the best approach with this subject is to simply state that if one prefers the sound quality of a DSD recording to the sound quality of a PCM recording, then purchase and enjoy what you like. As always, sorting out the marketing spin from facts can be dangerous. 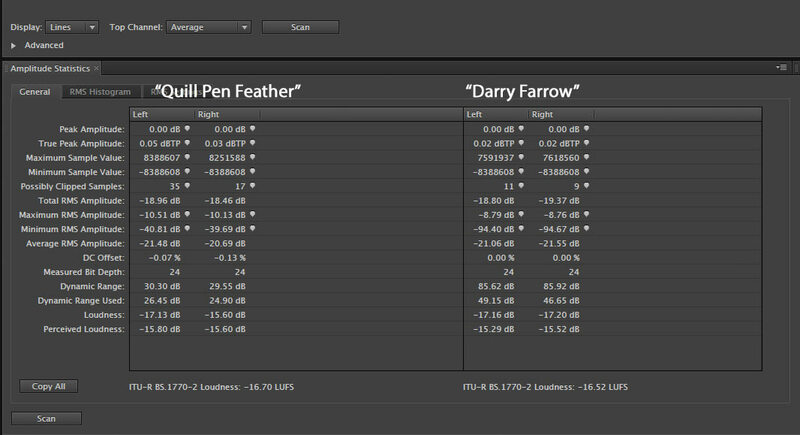 File size, DoP, Native DSD, it all gets very confusing. I repeat the same idea frequently. Listen to what you love and love what you listen to without regard to format, file size, or form factor. It’s all music. However, I do believe that a high-resolution music track done with no compromise recording methods can’t be topped. So sorry to read of the bad vibes.I know Paul far less well, but he has always seemed to be a real professional, and so is his son Scott. As I wrote a few weeks ago, stirring the drink is one thing, polarized points of view are a whole other scenario that usually doesn’t come out too well. Now that we’ve met and spoken so cordially and enjoyably, I will not be making any harsh statements in these ongoing posts. Whether it’s science or metaphysics, when highly divided points of view exist, the only workable thing to do is find the middle. As experienced and knowledgeable as you are, it’s the refusal to budge one inch , or acknowledge that it’s just a”What trade-offs can you live with?” situation that is likely causing the very unfortunate tones/reactions to be generated. I can’t tell you what the middle is in this arena as there are so many over-promoted opinions, but I personally try to find the middle if at all possible, even if I have to compromise my belief structure a bit. Not reversal, but just wherever point at which the waters clearly become relatively calm, just as you and I so rewardingly did. Craig, I have no problem being challenged…so don’t feel constrained because we’ve met and discussed issues cordially. I’m not shy about admitting when I’ve been wrong. I stated more than once that I enjoy the “ONE” music project. My criticism is that it’s hyped as a high-resolution, ultra fidelity demo disc when it’s a very nice sounding DSD 64 set of tracks. For some reason(s) you depict Dr. Waldrep as a biased, possibly technically illiterate, hothead. You may be right on (1) and (3). But, who cares? I just hope he hasn’t insulted you. Let’s do this: pick any song you’ve recorded on DSD and then pick any song that Mark has recorded. That’s right – you pick both songs. Now run them through the spectrum analyzer as Mark has done. Now, YOU comment on the observation and explain whatever differences you notice. One nice thing about our hobby is that it can and does include everyone. So, of course it’s ok to ignore the technical differences and say simply that you like the sound better. No one is going to berate you for that. I look forward to your acceptance of a comparison. I don’t recall seeing my double at the last family reunion. So did you pick my name to confuse or are you actually another Robert Werner? ‘He began with an inappropriate personal and professional slur about my expertise that doesn’t deserve repeating…then continued’. I think you should repeat his comments, it would serve to show the attitudes you are dealing with. If these people have to resort to name calling, they should be shown for what they are. By the way the graph doesn’t show up any better when clicked on, I couldn’t make out any of the text on it. I believe I’ll keep his statement private. After all, it was not written directly to me…but in response to another reader. I will lay out the post differently so that the text is clearer. Well, I guess you’re not going to be invited to the PS Audio Christmas party then….. I suppose, looking at it from Paul’s point of view, I could see where he might take your observations about using DSD in the production of his disc a little personally. Still, folks should be able to disagree and remain civil about it. Honestly, I believe I made more than a few very complimentary comments about the project. It’s a very nice collection of tracks but some very talented performers. I don’t like the differences in reverb levels, the compression is hit or miss, and as a demo disc it’s a little narrow with regards to genres choices, but it’s a nice disc. But for $35 for a 176 kHz/24-bit PCM download is too much when the native resolution is DSD 64. So, now we have a new little war among experts who are arguing over whether noise in a frequency range you can’t hear will or won’t mask signals if they exist at all in a frequency range you also can’t hear. Several weeks ago Bell Labs held a huge celebration at its Murray Hill NJ site honoring the work of the brilliant American mathematician Claude Shannon on the 100th anniversary of his birth. Shannon’s work has explained the requirements for modern telecommunication and information technology in both digital and analog domains. It is bedrock science and math for every serious engineer in those industries. The only ones who seem to fight it are audiophiles and those who manufacture products for them. Did the guy from AT&T ever even hear of him let alone study and understand his work? I’ll bet he didn’t. When all else is done, there’s always Michael Fremer who is there to laud his vinyl etchings, the son of shellac and grandson of wax cylinders. What a clown. I must say I was confused in the past about your complimentary comments towards PS Audio and its main man. The Benchmark guy I could see the alignment between you two, but not the PS Audio guy. His belief system wrt audio is simply incompatible with your rationality. I’ve met Paul a number of times and while we never agreed about formats or other audio questions, he seemed polite and very friendly…until I read his private comments to a mutual reader. I was wrong about him. Always a pity to take a hit for being truthful, and sadder to find that a friend really isn’t a friend..
An ad hominem response is the first clue when someone is unable to refute a valid argument. Classy, Paul. Forgive me if this is spelling out the obvious in the above post, but he is dead wrong on multiple counts. False. It’s not a matter of signal level falling, but that the rising noise floor buries whatever low-level details are present in the ultrasonic range. Look, there is no HF content below the noise floor. OK, so technically there is, but that’s not an accurate, nor usable recording then, is it? Seriously. That’s the true nature of DSD, and it actually does deserve to be bashed over it. It’s also false that Mark takes any opportunity to bash DSD. He does, however, publically refute false claims about it. A simple red herring fallacy. (Here we go again. So this time, if you can’t handle the truth, obfuscate it.) The point of high-res PCM is accuracy, not its ability to blast your tweeters with full-modulation tones in ultrasonic ranges. Some equipment would handle it, some wouldn’t. That is NOT the point. Honest HR recordings such as Aix Records contain measurable ultrasonic information (and here is the point) at realistic levels AND durations. Your system isn’t risking being strained by a continuous load of garbage noise. Mark, I hope at some point someone with deep pockets signs on to your scientific way of thinking and decides to wage a lawsuit (or better, a class-action lawsuit) against some of the liars profiting from the gullibility of rich audiophiles. It’s time. Enough with the ridiculous and fabricated claims, including the “superiorities” of DSD, which are slight at best. Science can easily hold up in the court of law. Thank you for “keeping the faith” and for exposing the facts over and over. Thanks Bill. I was surprised to read his comments…especially since I merely stated the facts and analyzed the work of his associates. In spite of straining a number of relationships, it’s important that I keep writing things as I see them. There are too many reviewers and others sucking up to the advertising dollars and saying things that are patently false. As a 43 year audiophile ( since I was 12) , it never ceases to amaze me at the level of nonsense disseminated by the music and audio industry. Despite living in the modern age , the gullibility of consumers hasn’t evolved on one jot . We actually WANT to believe the exaggerated claims of a significant cadre of manufacturers in their pseudo science and snake oil! Quite by accident , I recently came across a presentation on YouTube by Mark Waldrep. The honesty and the bravery of he man is quite evident. I just wanted to salute you sir. Naturally , you will become a bete noir to the purveyors of hyperbole , smoke and mirrors. Please keep up the great work ! Thanks John…it’s been an interesting experience.